Daal or dahl refers to lentils and pancharatan means "five jewels". The five jewels here are the most commonly used five lentils of Indian cuisine. 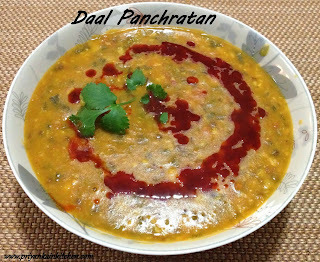 Another flavor in Daal Panchratan, that takes it to the whole new level is of white radish leaves. As the leaves are not available here in Australia, I have substituted them with Kale leaves. Kale not only maintains the great flavor, but also adds nutritional value to the dish. Wash and soak the lentils for 20 mins. In a pressure cooker, add lentils, kale leaves, turmeric powder, salt and enough water. Water level should be approximately 1 1/2 inch higher than that of lentils. Pressure cook on high until first whistle. Reduce the heat and cook for 5 more minutes. Turn off the heat. When the pressure is released, open the lid. Check if the lentils are soft, if not pressure cook for one more whistle. Else adjust the consistency of daal by adding boiling water to it. Heat a pan, add oil to it. When hot, add cumin seeds. let them crackle. Add tomato, green chilies, ginger, coriander powder & red chili powder. Fry it until it starts to leave the edges of the pan. Add boiled daal to it and let it cook until everything comes to a boil. Garnish with chopped coriander and serve hot with rice or chappati.